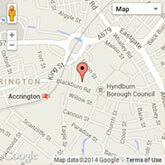 We are easy to find using postcode BB5 1PL and also accessible via local buses. Accrington Arndale is a shopping centre in Accrington Town Centre, easily accessible via car and bus. We have a wide selection of shops and 580 car park spaces with three hours free parking. Our recently opened food court is perfect for relaxing in between shopping. Our website contains offers for many of the shops in Accrington Arndale along with job vacancies and other useful information about the shopping centre. We also update the website on a regular basis with the latest news and events that you can take part in, enriching your shopping experience in Accrington!